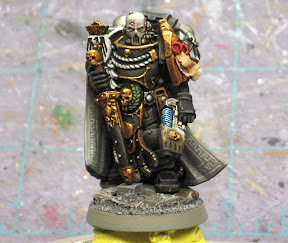 A long time ago (in the blogging world), I posted about making your army stand out. I had a few pics of some nice looking armies done by other gamers to show what I was talking about. The question I was looking at was how we all go about making our armies stand out from the crowd and how we make them our own. Since I'm building my new Deathwing (eventually), I find myself struggling with how to make them look different from the rest of the forces out there. And by different, I don't mean painting them orange or anything like that even though I'm sure that would work. I find myself struggling with the tiniest of things like how I'm going to paint the chapter symbol on their right shoulder so that it looks like something more than just a red blob sitting there. How I'm going to paint the bases to show that these guys are on a specific planet and not just another "battlefield?" So I got to thinking, what can we as gamers do to make our armies stand out and what are some of the more common solutions I've seen out there. This one is one of the easiest. Nothing more than a simple head swap or change of arms to give a model a different look. The big thing with this is that it doesn't require extensive greenstuff skills to pull off well. A well placed bit can change everything on a model. Along the lines of the first one, this is more of adding things to models. Things like backpacks, gun scopes, swords or anything like that. This one has the benefit of tying all your guys together too to give them a unified look. Once you start greenstuffing... it can be hard to stop. This is the next step after swapping out or adding on bits. You start making your own stuff or making things fit that wouldn't normally. This can be real simple like a pelt or real complex like a full length cloak on a model. The sky is the limit here. Whether you go with the Codex approved paint job or you make up your own, trying out a new color or method can make huge difference. Who cares if their guns are always red? Paint them blue or another color and see what it does to the look of the army. That might be all you need to rise above the rest of the crowd. Maybe it's a simple detail line an icon or a line around the border of an element. It doesn't always have to be complex. Maybe it's really nothing more than adding that one last layer of detail in terms of a final wash or line highlight or one last well defined shadow to your rank and file guys to finish them off. With the explosion of resin bases out there these days, it's become very easy to get a nice environmental feel to your force for just a little bit more work. Working with resin can seem daunting for some folks, but it's fairly easy actually. 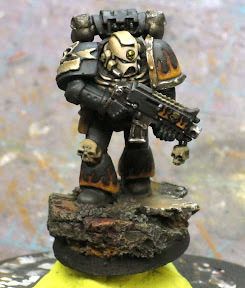 And even if you don't go the resin route, simply completing the basing on your army improves the look ten fold I think. There's nothing wrong at all with a basic textured base that is painted well. In the end, it shouldn't take much to get a good looking force that stands out from everything else out there. Nothing says you have to have a fully scratchbuilt army to look good. Just changing one little thing can be enough to make your guys really look sharp. 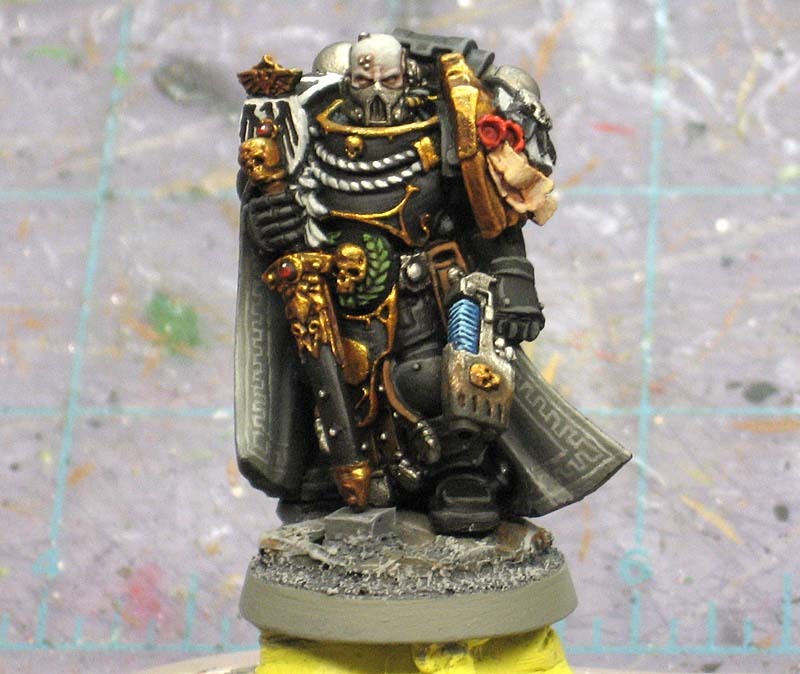 As for me, I'm thinking about adding tabards to my Terminators (all ten of them) to give them a different look. Of course then I have to figure out what color I'm going to paint them so that I don't look like everyone else out there. Great article! I'd say that basing adds the most bang for the buck, I've seen a number of fantastically painted armies that just looked bland because the bases were either unpainted or just painted green with no flocking or anything. Even just a little bit of gravel or a wee bit of static grass gives the model a sense of scale and (given an appropriate color) can really make the models 'pop'. Using a resin base with sculpted detail saves time and generally looks great, but you pay a bit for the upgrade. Nevertheless, it's a worthwhile addition to a model! Wow, glad you liked it guys. And thanks for the link Dave, I didn't see it before, but I'm off to look it over now. Even the slights swap of a head here and there can make a huge difference and basing is key for me. All my guys regardless of army get a dramatic base. Even though I think a lot of premade resin bases are very cool, I still prefer to make my own. I think on my current Dark Eldar army I've used about 150 tiny resin skulls so far on all the bases. Agree on all of it 100% especially since I have tried to do some (if not all of these) with my Smurfwing. God only knows how much I have spent on bits from Bits and Kits. The other thing that you didnt mention when it comes to painting is, if you are going chapter approved, to go for a little known chapter. There are many wonderful colour schemes out there that you never see. Like Simonster, I hate basing and go with the basic sand and flock method. To me a dynamic base, while lovely, detracts from the model. Not all good bases have to be ultra dynamic or over the top. But sand and flock just doesn't cut it for me. I feel that bases need to have character and tell a story. Something that binds the army together aesthetically. Plus when you get into larger bases like 60mm and large flying bases... that there is just so much real estate to do something awesome with your models. bases should also blend in to the miniature based on them in some manner for it to look right. even if its the most basic base, simply adding some weathering from that base to the feet and lower legs of the miniature helps to draw it together, in turn making it stand out more. what i have done with my basing and modeling of my bloodpact traitor guard is tried to show the advancing of the force, and themed it around an industrial/agricultural zoned area (think eastern europe, like seen in 'behind enemy lines'). autocannons, since they come on a tripod now with guard, and modeling into foxhole/trench dugouts with amounts of concrete on there bases to show that they are in that area, not just some random dugout somewhere, and positioned them to look like howitzers. the lascannon teams, being made using the old school cannons on wheels miniatures, are based to look like they have been moved into destroyed buildings and vehile wreckage to set up position. missile launcher teams, as are more mobile, are based to be more advancing with the main force, using rubble as cover to prep and then fire from behind. the platoons are modeled to all be running, over terrain that isnt constistanly flat, some of them even look like they have made it into the next industrial area by having concrete on some of there bases. the infiltrating units have alot of concrete or destroyed buildings on there bases to show how far ahead they have made it, as well as the units that go in scouting transports. and for special characters, leaders in units, etc there weapons are eye catching (all sarges, Lts, commanders, commisars have halberd style weapons) and there bases have more height to them (small mound, pile of skulls, wreckage) that put the miniature up higher to make them stand out as something that isnt just a grunt. as for vehicle that dont have bases, adding weathering that is similar to the colour of the bases that the rest of the army is mounted on helps to tie them in to the force beyond just the standard basic colour scheme theme. its not just the army that matters in my opinion, its the cinematic that the whole look and feel of them puts into your head that matters. "bases should also blend in to the miniature based on them in some manner for it to look right. even if its the most basic base, simply adding some weathering from that base to the feet and lower legs of the miniature helps to draw it together, in turn making it stand out more." This. So many paintjobs clash with a standard issue base that someone's just done on autopilot; at the very least, get some stains and splatters on the lower reaches! It's a damn good post, this one. 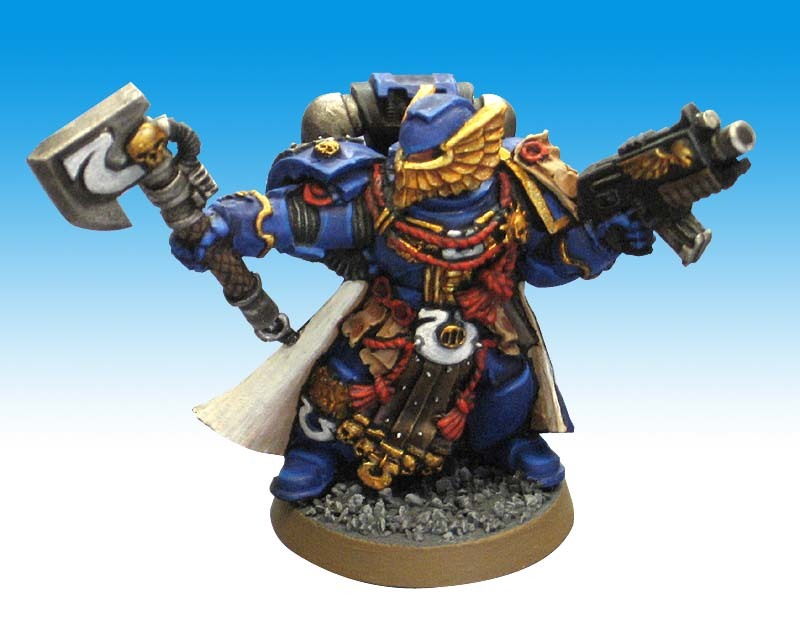 The greatest advantage of 40K as a setting is the opportunity to own your army and do something personal with it - it's a big galaxy with a lot of room for development in it. Since I'm doing Night Lords and some people on the Dakka blog say use LotD minis since they ave flames on would it be better to greenstuff the flames on the pad? Derina: If I were doing Night Lords, I don't know that I would use LoTD models myself. They have their flames etched into their armour and I thought Night Lords were more about Lightning bolts and such. Either way... it might be hard to cover those flames up with greenstuff... to the point of using other plain models and making it easier. Now if you wanted to add more flames, greenstuffing might be the answer, but I think the trick would be to make sure you get them very thin on the surface so they are subtle and not very chunky. Again it might be better to us eplain models and simply paint them (flames and or lighning bolts) on instead of greenstuffing them. I was thinking plane minis as well. Thanks Ron for a very fast responce. Might be getting some Ultras as a commission soon. Great article! I'm realizing all the things I'm doing wrong with my army. I love basing and I think that's my problem. It's all over the place! Terminators are in a wasteland, assault marines are in a rocky field, devastators are in a temple and dreadnoughts are in urban areas! Gotta pick a theme and stick to it..
JustPlainJim: It's the little things that add up. Just trying to be consistent with my force can be a challenge so I know what it's like.